Fatty Foods Bad For Sperm : Shots - Health News Saturated fat, the stuff in meat and dairy foods, was associated with lower sperm counts, in a study of 99 men who were clients of fertility clinics. The results, though preliminary, suggest there's something men can do to boost the odds their sperm are up to their evolutionary task: eat better. Eating foods high in saturated fat may increase fertility problems in men, a preliminary study finds. Men who eat a lot of fatty foods have lower quality sperm than men who avoid them, a new study found. Saturated fat, the stuff in meat and dairy foods, was associated with lower sperm counts. 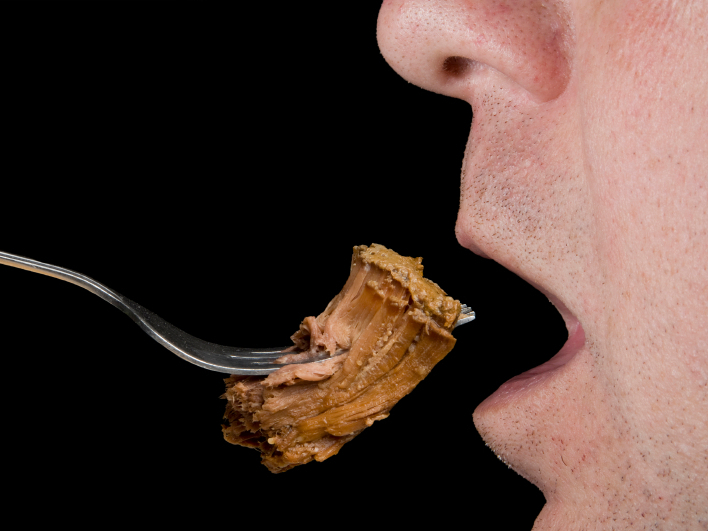 The men eating the most saturated fat had 35 percent fewer sperm than men eating the least. On the bright side, the men who ate more omega-3 fats — the kind found in fish and some plants — had slightly more sperm that were correctly formed than their brethren who ate less. The results, though preliminary, suggest there's something men can do to boost the odds their sperm are up to their evolutionary task: eat better. "Men really have very few things that they can modify with regards to fertility," says Jill Attaman, an assistant professor at Dartmouth Medical School, and a fertility specialist at Dartmouth-Hitchcock Medical Center in New Hampshire. She was the lead author on the study, which was just published in Human Reproduction. Scientists have only recently started looking at how lifestyle factors like diet and exercise affect men's fertility. Known risks including smoking, heavy use of alcohol and recreational drugs, and heat on the testicles. This study doesn't say if the men's diet caused the decline in sperm count. It just says they may be connected. The 99 men in this study were all clients at fertility clinics. They filled out a questionnaire listing what they ate. Male infertility is common. It affects 10 to 15 percent of couples. When a couple has difficulty conceiving a child, about one-third of the time the problem is with the man, and one-third of the time it's with the woman. Almost three-quarters of the men in the Dartmouth study were overweight or obese. Attaman says she doesn't know what role that plays in their fertility, but the number's similar to men in the general population. And previous studies have found that being obese can hurt male fertility. Eating better might not just have benefits for men's reproductive health, Attaman says, but could be better all ways around. Indeed. Yesterday, NPR's Allison Aubrey reported on how eating meat may increases a person's risk of death.